New ALMA observations show there is ordinary table salt in a not-so-ordinary location: 1,500 light-years from Earth in the disk surrounding a massive young star. Though salts have been found in the atmospheres of old, dying stars, this is the first time they have been seen around young stars in stellar nurseries. 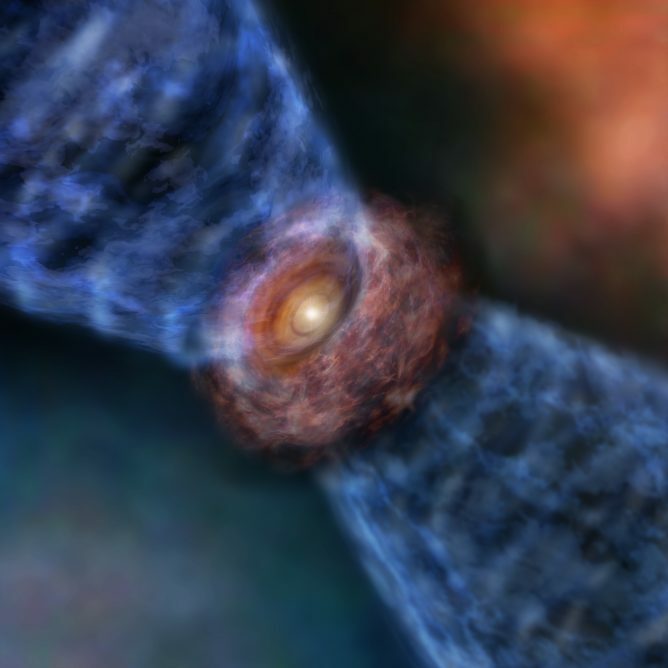 The detection of this salt-encrusted disk may help astronomers study the chemistry of star formation as well as identify other similar protostars hidden inside dense cocoons of dust and gas. Artist impression of Orion Source I, a young, massive star about 1,500 light-years away. 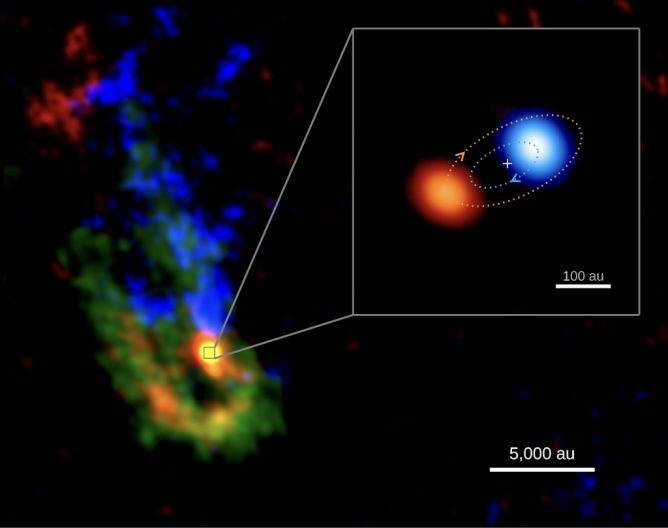 The blue region (about 1/3 the way out from the center of the disk) represents the region where ALMA detected the millimeter-wavelength “glow” from the salts. 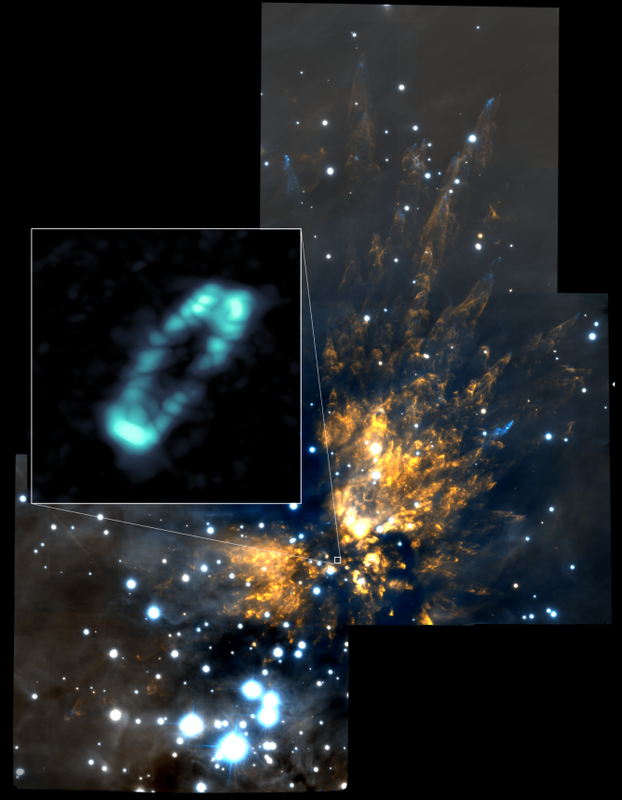 ALMA image of the salty disk surrounding the young, massive star Orion Source I (blue ring). It is shown in relation to the Orion Molecular Cloud 1, a region of explosive starbirth. The background near infrared image was taken with the Gemini Observatory. A team of astronomers and chemists using the Atacama Large Millimeter/submillimeter Array (ALMA) has detected the chemical fingerprints of sodium chloride (NaCl) and other similar salty compounds emanating from the dusty disk surrounding Orion Source I, a massive, young star in a dusty cloud behind the Orion Nebula. To detect molecules in space, astronomers use radio telescopes to search for their chemical signatures – telltale spikes in the spread-out spectra of radio and millimeter-wavelength light. Atoms and molecules emit these signals in several ways, depending on the temperature of their environments. The new ALMA observations contain a bristling array of spectral signatures – or transitions, as astronomers refer to them – of the same molecules. To create such strong and varied molecular fingerprints, the temperature differences where the molecules reside must be extreme, ranging anywhere from 100 kelvin to 4,000 kelvin (about -175 Celsius to 3700 Celsius). An in-depth study of these spectral spikes could provide insights about how the star is heating the disk, which would also be a useful measure of the luminosity of the star. 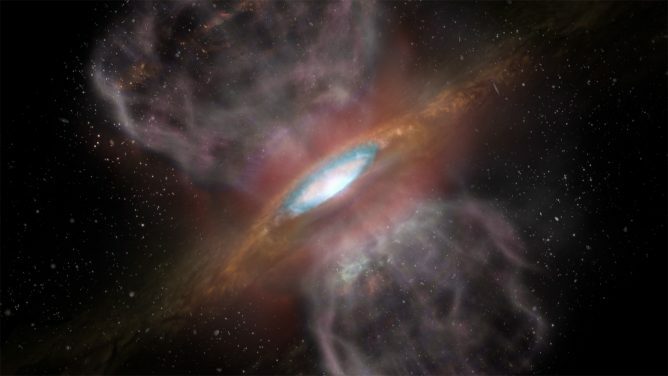 “When we look at the information ALMA has provided, we see about 60 different transitions – or unique fingerprints – of molecules like sodium chloride and potassium chloride coming from the disk. That is both shocking and exciting,” said Brett McGuire, a chemist at the NRAO in Charlottesville, Virginia, and co-author on the paper. The researchers speculate that these salts come from dust grains that collided and spilled their contents into the surrounding disk. Their observations confirm that the salty regions trace the location of the circumstellar disk. The detection of salts around a young star is also of interest to astronomers and astrochemists because some of constituent atoms of salts are metals – sodium and potassium. This suggests there may be other metal-containing molecules in this environment. If so, it may be possible to use similar observations to measure the amount of metals in star-forming regions. “This type of study is not available to us at all presently. Free-floating metallic compounds are generally invisible to radio astronomy,” noted McGuire. The salty signatures were found about 30 to 60 astronomical units (AU, or the average distance between the Earth and the Sun) from the host stars. Based on their observations, the astronomers infer that there may be as much as one sextillion (a one with 21 zeros after it) kilograms of salt in this region, which is roughly equivalent to the entire mass of Earth’s oceans. This news article was originally published by the U.S. National Radio Astronomy Observatory. These observation results were published as Ginsburg et al. 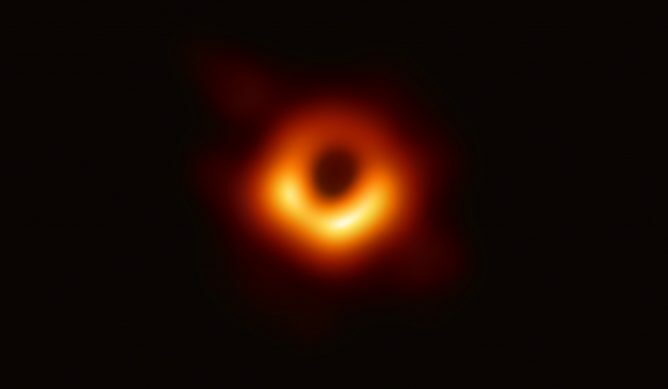 “Orion SrcI’s disk is salty,” in the Astrophysical Journal in February 2019. The ALMA Project in Japan is supported by the MEXT project to promote large scientific frontiers.